Phase one, infect a local population and turn them into engineered zombies. Phase two, relocate the patients who had the mutated strain for further experimentation. That appeared to have been the plan for Baseborn Identity Research, or at least the immediate one, but they hadn't taken into account Dave Pulaski and his insatiable desire to avenge his wife's death. They were playing the long game, but Dave's plan was simple - find Walt Freeman, the man responsible for his wife's death and the carnage in his home town, and kill him. The zombies, however, have upped their game; they've evolved once from draggers to cutters, and now they flay their victims alive. Whilst Dave will stop at nothing to deliver his judgement, fate puts someone in his path who gives him a whole new purpose. This person is Sasha, and she is the key to everything. But those in charge won't simply stand aside while he claims what could be their greatest triumph. Now he has a purpose, something other than revenge to die for, and nothing will stand in his way. If you're looking for a suspense-filled, creative, well-executed, zombie apocalypse style read, then you really want to give the Tell Me When I'm Dead series a try. 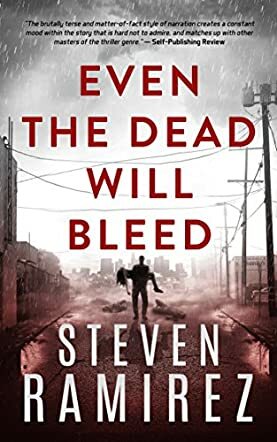 I came in at book three, Even the Dead will Bleed, but Steven Ramirez does an impeccable job at filling in the need to know details in order to make stand alone reading possible. I really appreciated the insertion of Spanish phrases as appropriate, and as a fairly competent speaker I was able to translate. However, the sentences are structured in such a way that the meaning is clear even with no knowledge of the language. This action-packed zombie gore-fest is not for the faint of heart as carnage and rising body counts are described in stomach churning, gruesome detail, but at no point is character development sacrificed. There is a perfect balance of character growth and development, action, intrigue and suspense that will keep the reader hooked from the first page to the ultimate conclusion. I've read my fair share of zombie style books, and this one certainly stands up there with the best. It's not your run of the mill, mass produced, zombie book; rather it is intricately designed, well-executed, imaginative and plausible. There's a lot to the plot, and I enjoyed every revelation.